When I heard about the shootings at the offices of Charlie Hebdo in Paris, I immediately thought of the religion scholar Stephen Prothero. 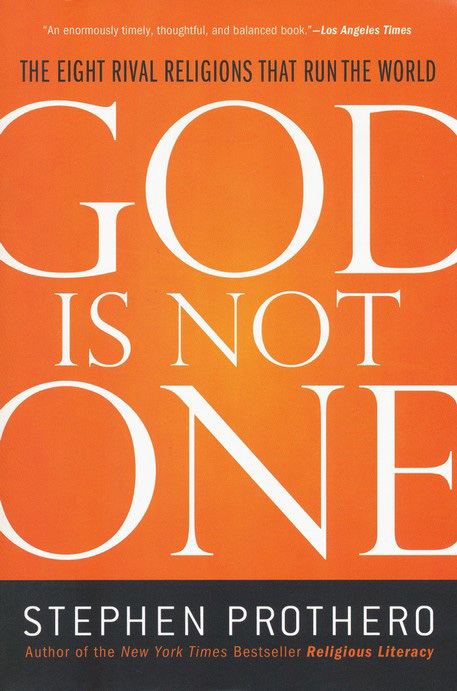 More specifically, I thought about his book God is Not One: The Eight Rival Religions that Run the World, which I finished reading just about a month ago. Prothero’s main argument is that despite the idealistic assertions of scholars past (including notables like Huston Smith, Swami Prabhavananda, Joseph Campbell, and others), all religions are not different paths en route to the summit of the same mountain. God is not One; to believe every religion strives for the same goal is to conflate all forms of religious beliefs and practices into a homogenous batter that eliminates the possibility for true understanding and tolerance. Prothero argues eloquently for “clear-eyed analysis” over blind idealizing or equally blind condemnation. If we want to understand why crude cartoons incite some to ire and some to even kill, we’ll need as much clear-eyed analysis as possible. Prothero, a Professor of Religion at Boston University, clearly feels at home introducing the lay reader to the complex mix of history, belief systems, and practices that make up each one of the eight “great” religions of the world. Prothero explains that when he describes a religion as “great,” he is basing this subjective view on the objective impact each religion has had on humanity. That impact can be gauged by examining the sheer number of practitioners, as well as taking into account less quantitatively-determined factors such as historical impact and current rise in prominence. The following are his great eight: Islam, Christianity, Confucianism, Hinduism, Buddhism, Yoruba religion, Judaism, and Daoism. He also includes a “brief coda” on Atheism, and makes an interesting case that many forms of atheism actually look quite like religion itself. Two of Prothero’s teaching paradigms push this book beyond a tidy summary of common religious movements into an insightful reexamination of the human impulse to worship in an organized/socially-recognizable manner. The first is a four-part approach. A simple yet effective way to sum-up a religion is to identify four defining elements: 1) the problem the religion seeks to solve, 2) the solution to the problem (the ultimate “goal”), 3) the techniques required to get from problem to solution, and 4) exemplars who have successfully walked the path, and who’s actions we can emulate. According to this model, we can break down Christianity into a religion in which 1) the problem is sin, 2) the solution is salvation, 3) the technique you need to use to be saved is a combination of good works and faith, 4) exemplars depend on what form of Christianity one adheres to (saints and martyrs for Roman Catholics and Orthodox believers, ordinary folks of faith for Protestants). I found this model very useful to explain Prothero’s thesis to my curious family members (warning: you will be asked LOTS of questions if you go around reading a print copy of this book. The title is too eye-catching). Perhaps reading this book around Christmastime while being surrounded by religious Venezuelan and Jamaican family members might have just been asking for trouble. But once I explained how religious scholars look for family resemblances rather than definitive markers to term any set of principles as a “religion,” people really perked up their ears. The point, of course, is that religion is about common overlapping elements rather than about a concrete formula. Prothero offers another handy way to categorize religious thought. Religion scholars often examine the four Cs (creed, cultus, code, and community), to try and ascertain what constitutes religion: “statements of beliefs and values (creeds); ritual activities (cultus); standards for ethical conduct (codes); and institutions (communities).” In the atheism chapter, Prothero points out how many atheists actually align their views with these four Cs, effectively making them adherents to a religion. While Prothero does not try to make a snide argument that all atheists are closet worshipers, he does do a good job of undermining the simplistic and reductive perspectives of prominent New Atheists (of the ilk of Richard Dawkins and Christopher Hitchens), showing how referring to religion with a capital R is inaccurate as well as priggish. Which brings us back to the beginning. Reading God is Not One is a great way to understand the staggering complexity of the deep foundations of current Hinduism, the mind-bending philosophical perspectives of at least three different schools of Buddhism, and why Confucianism can be considered a religion as well as a centuries-old guide to proper Chinese cultural behavior. It can also teach you the difference between Shia and Sunni Islam, and how the African religion of Yoruba is causing seismic cultural shifts in the Caribbean and South America. But this is not just a book of religious trivia. It is a careful effort to critique the idealism of the perennial philosophers. One can rightfully acknowledge the historical and contemporary horrors fueled by faith while never losing sight of what religion has achieved for good. But we won’t get anywhere assuming all religions are the same.